Steven (Chicagoland, United States) on 17 January 2018 in Architecture and Portfolio. Photo captured of Sun Life Financial and RBC Royal Bank in Toronto, Canada while on a double-decker tour bus on September 29, 2017. This is beautiful! I would live to visit Toronto! Haven’t been there yet! Cet homme en rouge au miroc ces building en fond et les reflet superbe ensemble. Wonderful reflections. It's nice to see my home city through the eyes and camera of another. Superbe prise de vue ..les reflets sur ces tours j'adore . De très belles couleurs et de superbes contrastes sur cette compo urbaine. Almost the same that mine Beautiful in color ! Superb framing of the architecture in the background and I like the splash of red contrasting with the blue. Toronto is such a lovely city. J'adore ! Le cadrage est parfait ! A fine capture of the interesting reflections. The bright looking fellow is an additon. A beautiful image of the impressive architecture. I like the double decker bus tour idea on a beautiful day like this. Superb composition with great colors and reflections . Striking geometry and awesome reflections in a captivating compositon! The red of man's clothing, makes a perfect contrast with the background. Nice capture of the Ice towers in the background as well. Good shooting from the tour bus, man ! @Rick: Thank you for identifying those towers! I couldn't find it earlier. Bon angle de prise de vue dynamique et superbes reflets ! 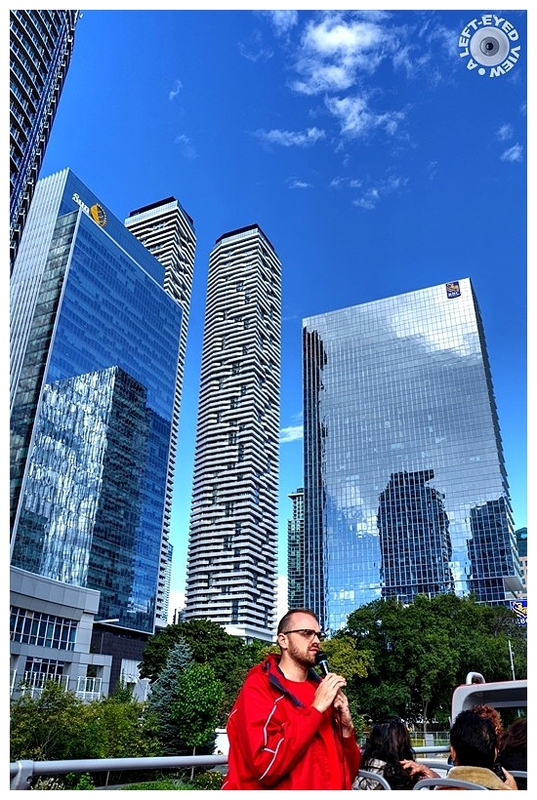 The red jacket is a nice addition to this city shot.